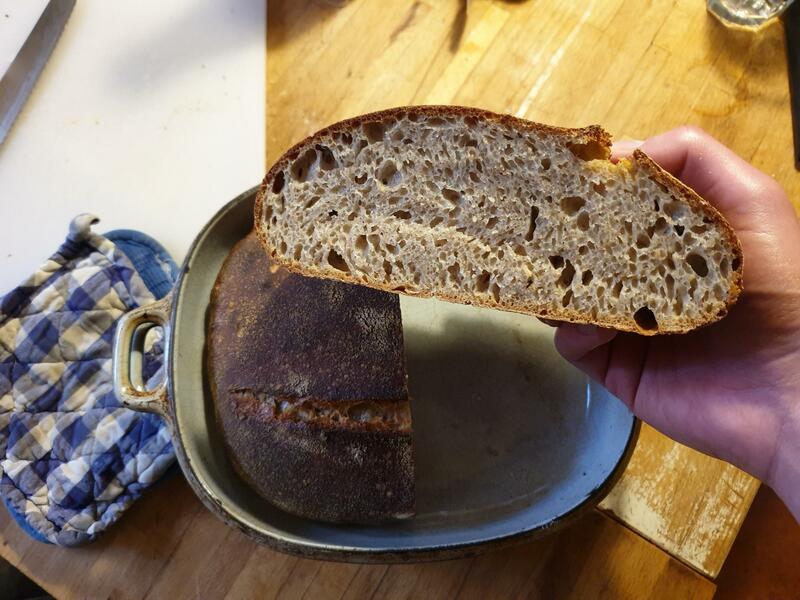 Scoring - why didn't my bread open at the seam? 300 gr 12% protein flour, 60 gr whole spelt flour, 30 gr rye, 20 gr whole wheat, 305 gr water, 80 gr white flour starter at 100% hydration. Total 450 gr flour, 345 gr water, about 77% hydration. Mix water and flour, autolyse 45 min. Mix in 9 gr salt and starter, using Rubaud method, for about 3 mins. Stretch and fold 4 times at about 30 min intervals. Let proof until increased about 50% in volume. Turn out onto bench and preshape without flour. Rest 15 min, then shape using stitching method. Rest 2 min, then transfer seam side up into bowl dusted with rice flour. Cold proof in fridge at 4C 15 hrs. When proofed transfer into dutch oven, preheated to 245 c, score off center, bake lid on for 20 mins. Continue baking 20 mins and finish with convection. ... until you switched flour? If it was working fine, and then as soon as you switched flour it wasn't working fine anymore, ... don't you already have the answer? Sure, it's probably because of the new flour, but I'm trying to figure out the underlying reason. I would like to continue using the flour I switched to. 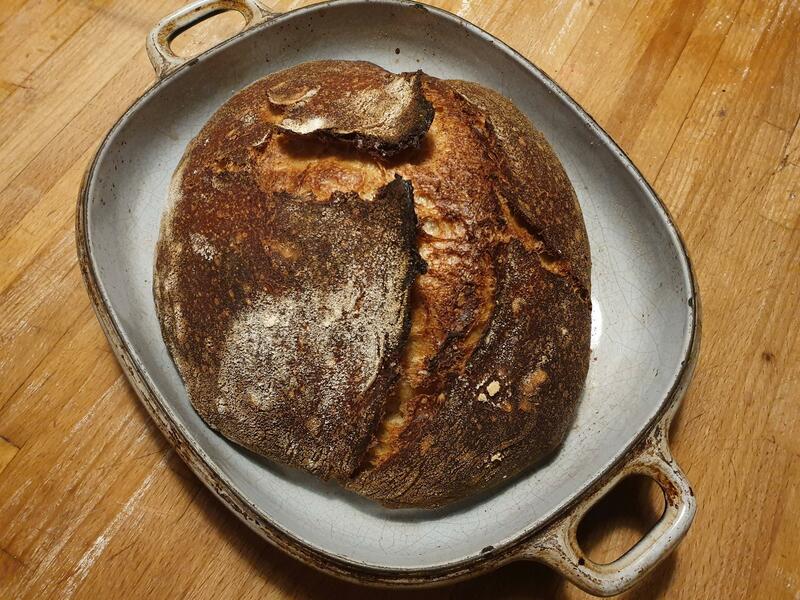 I'm thinking it's possible to achieve a more open scoring using most kinds of flour, unless this specific flour has some properties that somehow makes the crust ultra-extensible. Before you attribute the difference in your result to the new flour, I'd like to know what the old flour's protein percentage was. And did the dough feel different as you handled it? More sticky, for example. Just looking at your photos, what strikes me is the burst at right angles to your cut. This suggests a weakness in your shaping. The difference in crust consistency could be due to a difference in how you baked the loaf or in effective hydration. In other words, a less thirsty flour would result in more free water and a softer crust, all else being equal. Hi David, thanks for your suggestions. The old flour has 11% protein according to the package, and contains ascorbic acid, which the new one doesn't. As far as I recall, there wasn't any major difference in the handling, but I'm not the most experienced in that regard. I do have a couple of pictures of the shaping and after the final proofing, where you can see a few bubbles poking through the surface of the dough. Could that maybe imply a lack of structure? Thanks again.